Description: CPU only Warp3D implementation by Alain Thellier. o Wazp3D can lie and pretend to have a "perfect hardware driver" so the 3D-softwares will not fail due to a lacking feature. The Wazp3D-Prefs tool allows to change some settings for Wazp3D. Wazp3D-Prefs works changing settings on the fly. You can use it before or while a 3D program is running. But it is recommended to use Wazp3D-Prefs BEFORE starting your-3d-program for the first time. You set the settings you want, you close it and then you start the 3D program. Just open Wazp3D-Prefs, change the settings and close it again. in a file called wazp3d.cfg in the current directory. Next time you run your 3D program settings will be loaded from this file. 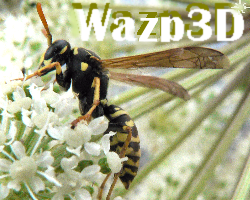 close Wazp3D-Prefs and start your-3d-program. In Wazp3D-Prefs all options with a '+' like "+Renderer:hard" cannot be changed on the fly. You need to set them BEFORE starting your-3d-program for the first time. it will only have effect next time you run the program. Wazp3D was first created to test the "Tales of Tamar"'s 3D Map inside WinUAE. OS4 progs dont works because OS4emu dont support Warp3D V5 (the OS4 one used for OS4 MiniGL progs). "Renderer:Hard/bm+clr" same but clear the bitmap. May need to disable "Use Clear Image" and/or "Use ClearDrawRegion"
3) New ppc OS4 progs dont works because OS4emu dont support Warp3D v5 (the OS4 one used for MiniGL progs). This version have software rendering and "renderer:hard" that use hardware TinyGL giving fast performances. Wazp3D-Prefs dont works well sometime you will need to set again "Perspective:No"
Joined Wazp3D.cfg files for Blender,Giddy,Turrican. Now the StateTracker analyse very smartly if the current states have really changed. So well written Amiga games like "Cube" are now very fast with "renderer:hard overlay"
What is Compositing 2D ? Amiga OS4 got the new graphics.library/CompositeTags() function. But CompositeTags() also allow to draw textured triangles with corrected perspective and filtering. dont have TexEnv modes (=Coloring GL) like Modulate/Blend/Decal. Note: LodePaint & "I have no tomatoes" still need "Hack Texs|No (safe)"
Note: D3gnop need "Force IndirectMode:OFF"
Note: FPSE dont (yet) support "Renderer:hard overlay"
o Fog works for "Renderer:hard" (Cube,etc...). Fog is slightly false for "Renderer:soft". o NEW: "Hack Texs: RGBA" option that convert all textures to RGBA32 so faster with "Renderer:Soft to Image"
overlay is now locked to current window so avoid to lock to shell-window like this "glExcess_os3 > nil:"
o Bugs fixed about pointers (may had cause crashes). W3D_SetBlendMode() is now perfectly emulated. This hard mode works only inside WinUAE in windowed mode. o "Directly draw in Bitmap" works better . Use it now for a better StormMesa emulation on a 32 bits screen (window-resizing works now). o GlTron works now but distorted. o New Options "Use Coloring GL" "Use Ratio Alpha" "Use AlphaMin&Max" "Debug Tex Number" "Use Quake Patch"
o The old option "Only Fast RGB24" is changed to "Only TrueColor 24&32"
o New options "Use ClearImage" & "Update At UnlockHardware " to enhance update for some programs like gears(screen),Engine, sKulpt or TheVague. o Corrected a very bad bug concerning pixels-buffering. o Project's name changed to "Wazp3D"